Since early 2018, Intract Australia and McMahon Services have worked collaboratively on their largest jointly delivered project, the delivery of Civil Infrastructure Package of Works at for the Osborne South Development Project. To date the Intract-McMahon Services team has delivered a variety of civil infrastructure works across the 185,000m² site including bulk earthworks, detailed earthworks, piling pads, demolition works, pile trimming, heavy-duty pavement construction, asbestos remediation, soil management, stormwater management, common services trenching and temporary site facilities including haul roads, carparks, and hardstands for a temporary site precast yard. The project is currently delivering a 18% Indigenous participation result, with the majority of Indigenous personnel on site being made up of plant operators and site labourers who are receiving ongoing on the job training. The project’s Indigenous trainee safety advisor, James Fry, has progressed in his skills development whilst on the project and is now a fully qualified Site Safety Advisor leading safety management for the project team across the project. 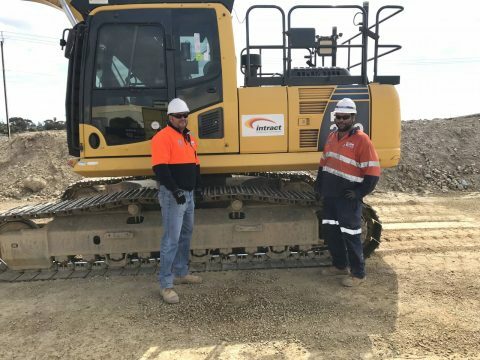 The opportunity for this jointly delivered project came about when the Osborne South Development Project Managing Contractor, Lendlease Building, were looking to engage with an Indigenous business in a meaningful way that would go above and beyond the mandatory contract requirements set by Government. The Intract-McMahon Services team provided the optimal outcome for Leadlease as Intract could provide Indigenous ‘boots on the ground’ while McMahon Services were able to mobilise quickly and utilise their civil construction expertise and track record to deliver the civil infrastructure works. With the current works under contract, the Intract-McMahon Services delivery team will continue on site well into 2019. When complete, the Osborne Naval Shipyards will support current and future naval ship development, operations and maintenance programs.